I should preface this review with the fact that this isn’t my first time here but it is the first time in a long time that I have been here and didn’t order a beer. Because this is the one place where you want to come to order a beer. They have over 100 beers on tap in the center bar (I say 100 because there is truly too many to count), and you can see the kegs in the glass enclosed room right by the main entrance, so the beer flows over head to be served up at the bar. This really is a beer lovers paradise, they have such a wide range of beers that you are bound to find at least one that you enjoy. And if you would like to take a look at their massive beer listing you can click here. 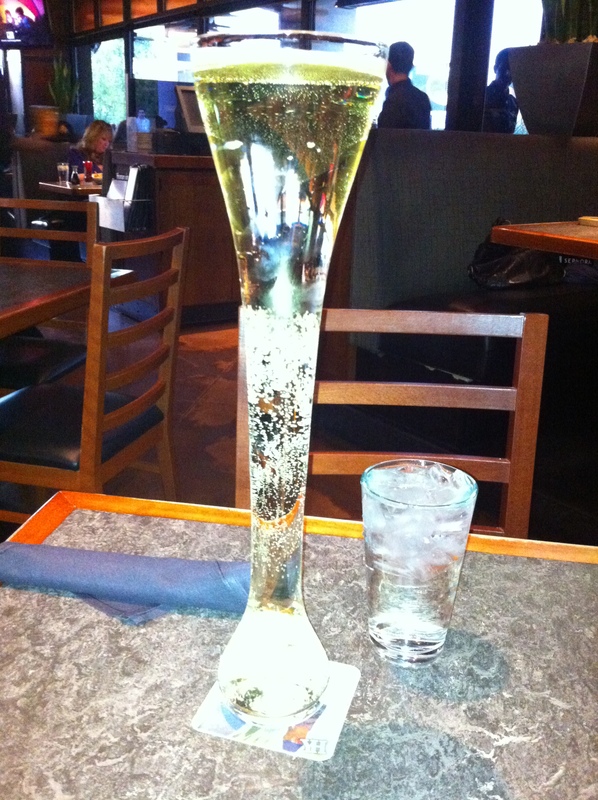 My friend is big on ciders so she ordered the pear cider in the traditional yard glass that started it all. If you would like to read about how it all got started click here and it will take you to their website’s about page. We got to the yard house at the end of happy hour which runs 3pm – 6pm Monday – Friday & 10pm – close Sunday – Wednesday; during happy hour their drinks range in price from $2.25 – 10.00 depending on the size of the glass and on if you order beer, wine or cocktails. They also have select appetizers and sliders that are half off. This is a really good time to come here, their sliders are really good and I will tell you about some of the happy house appetizers that we got, since we took advantage of getting there 10 mins before the end. But I want to start off with the one item that was not part of the happy hour and that was my dinner. Coming in I knew that I was craving carbs so I went straight for the (Mac+Cheese)². This pasta is a mixture of chicken breast, applewood bacon, wild mushrooms, cheddar, parmesan, pasta and truffle oil; I apologize for the messy looking plate, I stirred it up right as it got me without thinking about taking a picture. Oh well you can see all the cheesy glory just as well in the above picture. 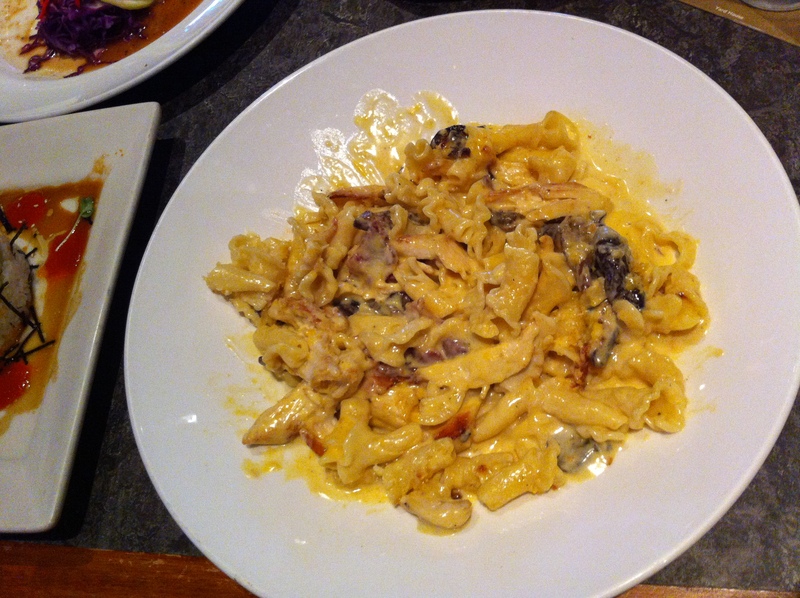 I really enjoyed this dish, it is the perfect balance of cheese, pasta and chicken, everything just melts together and makes for one delicious bite and hey there is bacon in there and who doesn’t love bacon? I will admit that the truffle oil is not very prevalent in this dish, truthfully I actually forgot it was in there until I double checked the ingredients. Luckily for me this does not change the way that I feel about this pasta dish, it is one of my favorites to get here. Because there is something to be said for the simple dishes, things do not need to be overly complicated to be good, and the fact that this can be accomplished in a busy restaurant is even better. This time the mess was not me, the waiter almost lost the sauce on the table as he delivered the food, I blame carrying 4 plates of food to our table all on his arms to be the problem. 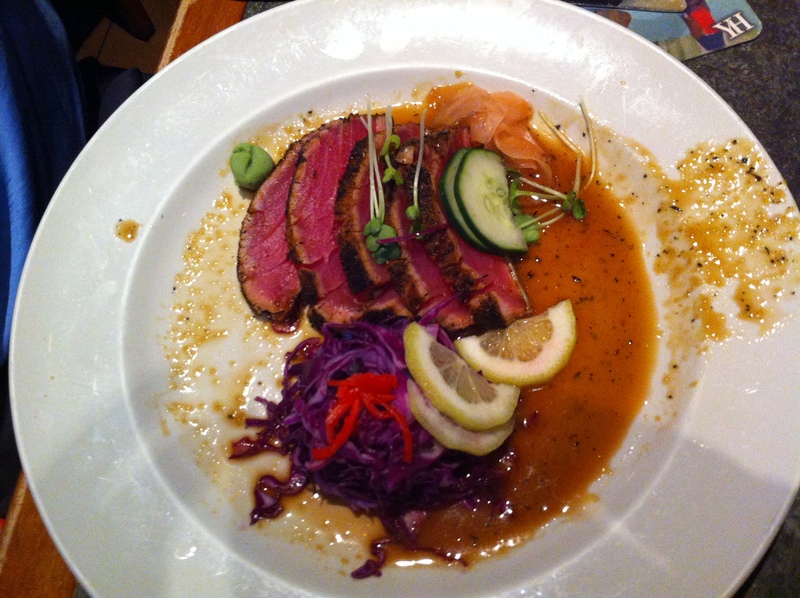 The Ahi Tuna is seared rare, and served with soy vinaigrette, wasabi and pickled ginger. The tuna was cooked perfectly, often times I have seen tuna ordered and it comes out over cooked, which really takes away the integrity of the tuna, but they got it just right. I only had one bite of this as this was my friend’s dish and truthfully I was sick the week before and didn’t want to risk anything by eating raw fish. But I really enjoyed the subtle tuna flavor and the soy vinaigrette was a nice compliment. I know that it states it comes with wasabi but I didn’t put any on my bite which I wish I did because I think that level of flavor would elevate the vinaigrette up. I have already mentioned to my mother that she should give this dish a try next time she heads to the Yard House since she is a big Ahi Tuna fan, I think she would really enjoy this dish. My friend did be sure to tell me that she really enjoyed this and would have this again without question. You can get the wings in buffalo, jerk or firecracker and come boneless or bone-in. We got them plain and they came with a honey barbeque sauce and ranch for dipping. While I normally am a big fan of chicken wings of all kinds these are definitely a dish to skip. They were over fried (that isn’t a dark photo they really were that dark) which made them really crunchy and I couldn’t taste any chicken just batter. 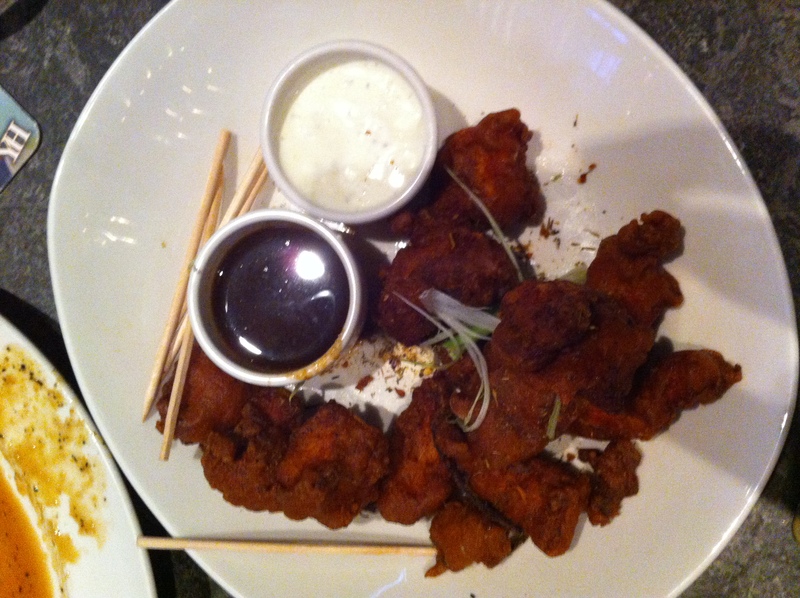 The dipping sauces were both really good and had the chicken been up to par this could’ve been a really good dish. I would tell you to skip right over this one, not one of their bests that’s for sure. The California roll is not your average sushi roll as you can see; they use as described on their menu, a sushi rice cake with cucumber, snow crab, tobiko, avocado fan and wasabi soy sauce. This has actually become one of my new favorite dishes from the Yard House, I never ordered it before because I always just assumed it was going to be a traditional California roll that you get everywhere, but I was delightfully surprised when it came to the table and honestly I actually am kind of craving it as I write this. I really enjoyed the way that it was put together and you got this nice blend of rice, crab & avocado then on the back end there was the wasabi kicker, which I really liked. It gives the whole bite a level up in flavor and it was not over powering so you still got to taste all the other ingredients on the plate. 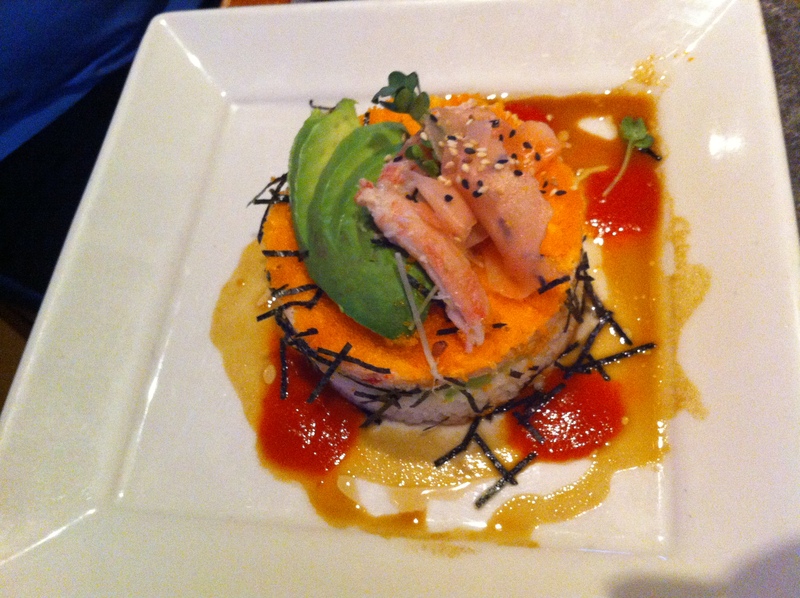 My friend wasn’t a big fan of this because of the wasabi flavor, so she barely touched the dish. Even with the over cooked chicken dish; which truthfully is the first thing I have had that really was under par, I would highly recommend you check them out if you are looking for a place to kick back and sample some beers and get great food to go along. With over a 100 beers to choose from you certainly won’t be out of choices. I say give the Big Sky Moose Drool a shot if you like brown ales; the first time I ordered it, it was strictly because it was fun to order after a couple already and then it turned out to be one of my go to beers. They do have two locations here in Las Vegas the one at Town Square and the second one in Red Rock casino, you won’t be disappointed at either location. The service we experienced was pretty good our waitress was very attentive at the beginning but towards the end it seemed like it took a long time to actually get our bill, I assume this is because she hoped that maybe we would order more drinks or food while my friend finished her large beer. The service is the only reason I took off a half star.